Gina is a professional promoter/marketing specialist with her own promotions company as well as a published model. She lives an active, healthy life. She has always been very curvy and while overall happy with her appearance, she has wrestled with her hips, thighs and lower abs. 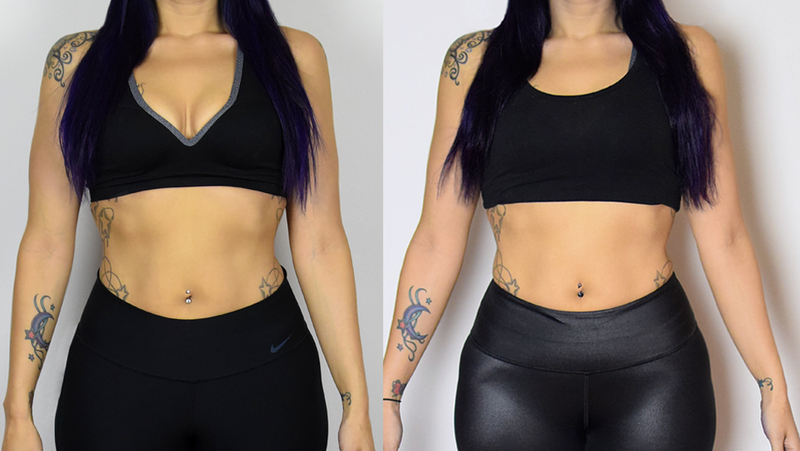 We interviewed Gina back in July, after her successful 8-week journey with a latex waist trainer. But she wanted to go even further. With a steel-boned corset, Gina was able to step up her waist training game. The compression was even more dramatic, and she boosted her routine: instead of wearing it just during workouts, she wore the corset every day. Over the following weeks and months she was able to drop from a size 4 to a size 2 and tone up her abs. During photo shoots, her photographer noted the huge improvements in her posture and her confidence. I am a professional promoter/marketing specialist with my own promotions company. I am also a published model. I try to stay active and healthy, and I enjoy a wide variety of activities such as cooking, swimming, jogging, and reading. Overall I am happy with my appearance, but my trouble spots are my thighs and lower abs. When I started waist training my goal was to tone up and correct my posture. I feel like I had begun to achieve this with the first waist trainer I used (Latex Waist Cincher by Ann Chery), but I was looking for something to wear when I wasn’t excerising that would be comfortable and fashionable at the same time. I used the Black Cashmere Underbust Corset because I absolutely loved the look of it. I was looking for something both functional and fashionable. I was also very interested in trying a different type of garment than my last one to see what the differences were and what the different benefits would be. When I first tried the garment I was at home. It was easy to put on. I found it to be both comfortable and aesthetically pleasing. I was very excited to begin using it for waist training. When I first started using the garment I would put it on for a few hours at a time. I used it pretty much every day and increased the amount of time I wore it each week. I also made use of it for photo shoots and as a fun fashion accessory. This garment definitely lived up to my expectations. Overall it was comfortable, easy to put on, easy to clean, and went well with everything I wore it with. I got exactly what I was looking for: a comfortable and fashionable waist trainer that actually worked. I kept my routine the same. I always try to eat healthy and I work out regularly. While waist training, the only thing I did differently was intensify my workouts. I did a little more cardio and strength training. I have always been very curvy. My hips are a full foot wider than my waist. It has always been a challenge for me to lose weight in my hips and thighs. I also struggle with my lower abs a little. I really feel this garment has helped me to tone up and greatly improved my posture. My photographer says he can definitely see a difference in my posture and confidence when I shoot. I was able to feel results before I could see them. I felt my posture getting better by the second week, and I could see my stomach getting a little smaller and tighter by the end of the first month. By the fourth month I could physically see a huge improvement in my posture as well as loss of mass. I am down to a size 2. I was a 4 when I started waist training with this product. My boyfriend, friends, family, and photographer have all noticed a difference. They all say my posture has improved and I look “smaller” or “toned”. My photographer has noticed an improvement in my posture and overall confidence level as well. I think it is very important to find exactly what you need to achieve the results you are looking for. Make sure the product you choose fits you properly and will serve its intended purpose. I was not looking for undergarments that slim me until I take them off. I was looking for long term results and an improvement in my posture and overall health. I feel because I used the trainer as part of my routine it has helped me to achieve my goals. I will definitely continue to use it regularly and I can't wait to try more products from Hourglass Angel!